One of the biggest tasks of a military wife when her husband comes home is to prepare a sumptuous meal that will fill his tummy, heart and soul. I've read from the story of a fellow military wife (the comedian Jon Santos' mother) printed in one of PMA's publications that it should be a conscious effort to make our home a heaven on Earth. So aside from taking a great shower, using the best underwear (please don't be a killjoy and roll your eyes), cleaning the bathroom and changing the bed sheets, I enslave myself into thinking of what kind of feast could I prepare for my Army kind of guy. Enter Pochero. Usually, most cooks use beef. I do, too, but have bought pork that day so I used it anyway. For those unfamiliar with the dish, it's like nilagang baka but with tomato sauce, garbanzos and some oomph. What made my pochero different (but doable) is that I didn't have garbanzos (who's prepared?! ), I used Hunt's Pork and Beans instead. It added more flavor to it, actually. Without much further ado, let me share with you my easy home-style recipe of Pork Pochero. 2. Saute the King Sue Ham's chorizo de bilbao. Make sure the fire's in medium-heat so as to make the chorizo releases its flavor to the oil. Set aside. 3. Saute onion until translucent. Let the garlic join the party. Don't allow the garlic to have lots of fun and burn. It'll be bitter. Remember the chorizo? Put it back to the pochero party. 4. Add in the pork and let it dance with the aromatics. 5. To make it more aromatic and flavorful, two large bay leaves could do so much. 7. Once the meat is cooked (test if you could chew it but don't put the chewed pork back ha), add in the potatoes and cook until your desired form. Then the bananas. Cover. 8. 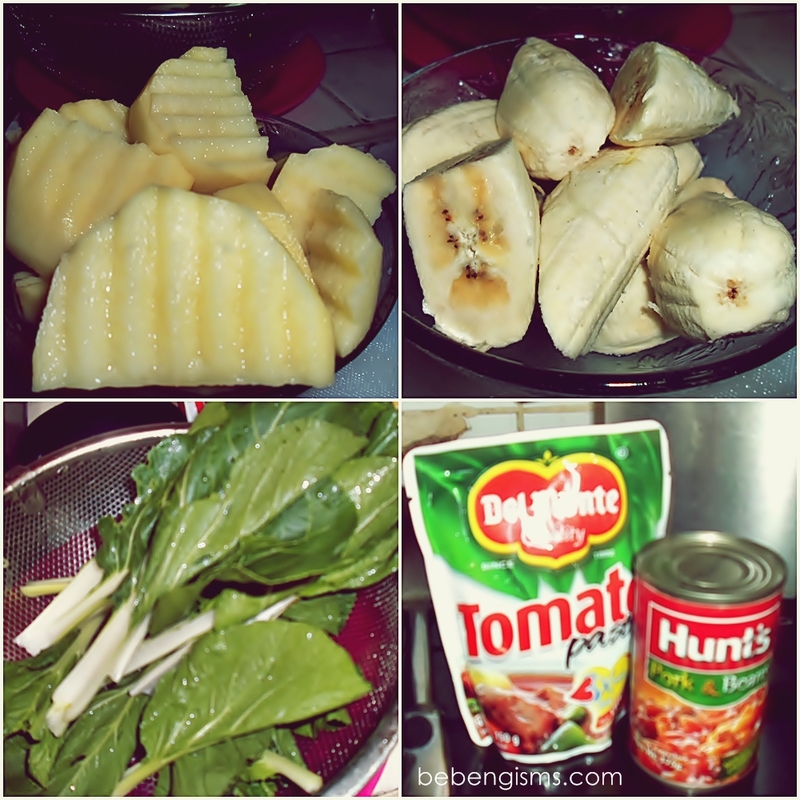 Once the potatoes and bananas are half-cooked, let the 4 tablespoons of tomato paste make the soup thick. Stir a bit. 9. The sour-y taste of the tomato might turn you off so the fun part is, Hunt's pork and beans will sweeten it. Don't overcook the beans. 10. Immediately follow it by putting the pechay leaves. Let carry-over cooking do the rest. See, easy breezy! This is also good for your little picky-eaters. The dish itself is a complete meal. Try it and share how you fared.